Following these five tips will help keep your site in tip-top shape! Empty your spam folder regularly. An overflowing spam folder is hard on the system and can open up OpenCUNY to spam attacks. Don’t approve comments with questionable links—whether in the text of the comment or website link field. Approving comments from spammers can allow them to maliciously spam our system at a deeper level. Tweak your settings. If you visit the Settings section of the Dashboard, you’ll see a list of your basic blog settings: General, Writing, Reading, Discussion, Media. In reading through them and adjusting the settings, you’ll learn about all the basic features of your site, like the privacy level (read more here), how many posts show up on your front page, how to display a static front page, etc. Edit your theme and Theme Options. By default, all sites start with the most recent theme developed by WordPress and released alongside the newest update of WordPress (read more about WordPress updates here). All of WordPress’s themes are fairly flexible, but if the default doesn’t suit your needs, we have a range of other themes on our system. 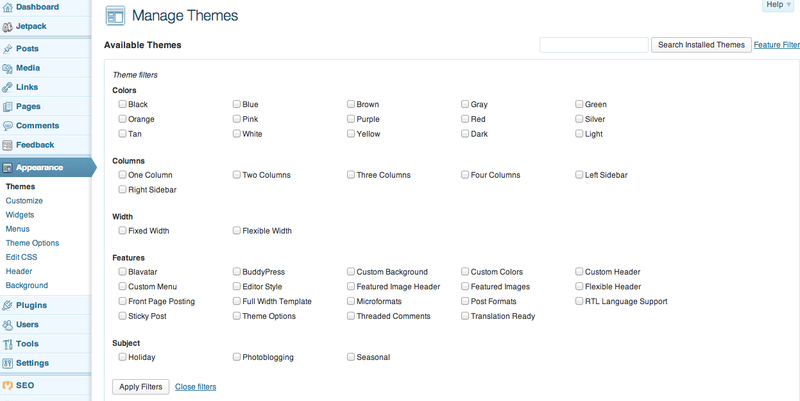 When you go to Appearance: Themes in the Dashboard, you can use the Feature Filter on the right near the top (see picture) to specify layout and feature attributes you want in your theme. Once you select and activate a theme, you’ll see Theme Options in the Appearances menu and often other items (e.g. Header, Background) depending on your selected theme. Some themes have extensive Theme Options that will allow you to adjust much of the layout, while others have less flexibility. Using the Feature Filter and reading about the theme on the WordPress Codex can help you make an informed decision. If you see a recently updated and highly rated free and open-source theme on the Codex that you would like to use, but which isn’t on the OpenCUNY system, you can request a new theme here. Activate plugins. Once you’ve started to add content to your site, you may find that you would like to add more features to your site, like a calendar for events, contact forms, maps, etc. OpenCUNY has an extensive list of plugins that you can access and activate in the Plugins menu on the Dashboard that will add new and needed functionalities to your site. If you don’t see a plugin that you need, you can search the WordPress Codex and request the plugin. To read about five common plugins, visit our post here. Deactivate unused plugins. If you find that you aren’t using a plugin that you activated, it is always a good idea to deactivate it. Activated but unused plugins can still consume memory on your site and can sometimes interact badly with other plugins you’re using.